Early in the summer of 2012, Bob Diamond was an American banker with a talent for making numbers say what he wanted them to say. He was legit and was sitting in the catbird seat at Barclays Bank UK. He’d made $100 million over the previous six years. A few weeks later, in early July, the world had flipped. Instead of sitting at his desk at Barclays Diamond was answering questions from a Parliamentary committee investigating LIBOR rate-fixing in 2008. A week after that he was out of work. What’s LIBOR? The London Interbank Offered Rate measures the price at which banks lend currencies to each other. It gauges how much banks charge each other when they carry out interbank trades and it affects the rates businesses and households all over the world pay on loans and other financial products. Diamond lost his job and Barclays was fined £290m. It was the financial scandal of the summer. Some say of the century, but we’ve got plenty of time to go yet. July, 2012 was just the first act. The European Union wasn’t asleep at the wheel and started to investigate two other currency markets, the EURIBOR and the Yen LIBOR. They took their time and announced their findings two days ago. It turns out to be a good deal more serious than having to sweat through a rough morning in Parliament. Barclays got off with a £290m penalty in 2012 for their bad behavior. Maybe that wiped out a quarter or a half year’s earnings, and brought them some bad publicity. They found a way to dodge the bullet this time. On Wednesday it was Joaquín Almunia’s job to announce EU charges against the banks involved. Almunia is the European Commission Vice-President in charge of competition policy. He stood behind the podium in Brussels looking like the stern accountant with the big glasses who comes in to set things straight after the wild party’s over. The European Commission was going to levy €1.7bn in fines on seven banks and a brokerage firm for their roles in the worldwide interest rate manipulation. Banks named were Barclays, UBS, the Royal Bank of Scotland (RBS, bailed out at taxpayer expense), Deutsche Bank, Société Générale and two American banks, Citigroup and JP Morgan. A brokerage house, RP Martin, is in the mix, too. They’re contesting the charges and the fine. The tables with the damages, courtesy the EC, are included here as illustrations. For its part of the deal, RBS will pay another £300m on top of the £390m it has already paid to US and UK regulators. RBS is a nationalized bank. That means English taxpayers will pick up the tab for the bank’s behavior. Barclays was the first bank caught in the sting back in 2012. They knew which way the wind was blowing. They decided to cut a deal: by exposing the cartel in Euribor rate-fixing they avoided an additional £570m fine. Swiss bank UBS was spared a £2bn fine by doing the same for the rigging of yen interest rates. A cartel? The banks were working together? This is where things get interesting. “What is shocking about the Libor and Euribor scandals is not only the manipulation of benchmarks, which is being tackled by financial regulators worldwide, but also the collusion between banks who are supposed to be competing with each other,” Almunia said. Which is a nice, elaborate way of saying, we burned the witches and got off scot-free. Would the EU have known about the Euribor fix if they hadn’t? What we know now that we didn’t know in June 2012 was that the banks acted in concert. They didn’t compete on rates, they put their heads together and figured out a way to make even more money by jiggering them. Maybe you’ve read the emails where the traders promise each other crates of champagne if they help each other out. Which is something else that makes it difficult to believe in those “two former traders during a one-month period in early 2007.” The banks are all bonus-driven, and maybe the best way to survive is not to let your boss know what you’re doing. Results are what matter. JP Morgan and the others have cleaned house, and those two rogues won’t be heard from again. Welcome to the world of the international cartels. The banks now work together to raise interest rates on everybody across the globe. The compliance officer at UBS saved his bank a €2.5bn by blowing the whistle on the yen scam. Maybe bankers only object when the numbers go over a billion. Almunia said there is more to come. “This will not be the end of the story.” The EU is investigating the firms that refused to settle with the EC over the EURIBOR and yen LIBOR charges, and is taking a look at possible shenanigans in the FOREX market. Regulators in other countries are hard at work as well. But that’s the problem. We’ve been stuck at the beginning for a while now: the banks find a new way to transgress, they make a bundle, investigators announce fines a few years later, somebody walks the plank and on we go to the next round. The fines are big but they won’t hurt the banks too much. Nobody’s going out of business. They’ve got Quantitative Easing to thank for that. It’s a nice little program that helps out when the banks get tight. You get knocked around on the market these days but there’s always a government somewhere to help you out. Even the moderate Socialist “enemy of finance” French government. Whenever Dexia in Belgium gets in a tight spot, François Hollande sends somebody over with a few billion to stop the bleeding. Too much old French money there to take any chances. Bob Diamond’s long gone. He at least lost his job. Nobody remembers him. Where’d he go with all his millions? Who cares? There’s another millionaire to take his place, saying the same things about how it was all done by subordinates and he had no knowledge. Nobody knows what’s going on at the banks, the traders and compliance officers are running wild. Then one or two of them get caught, there’s an investigation, the bank shells out, somebody leaves and somebody else takes his place and life goes on, right over the waterfall until we all get soaked. 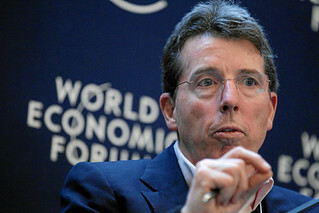 Where’s Bob Diamond these days? In some nice paradise where he’s laughing his head off. What’s that to any of us?